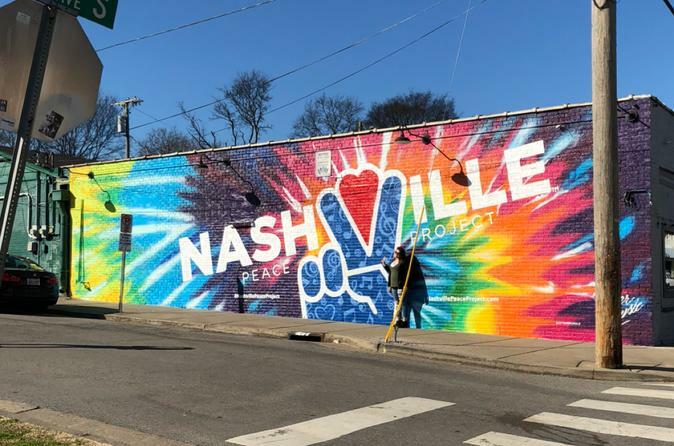 Nashville has some of the best murals in the world. With this scavenger hunt you can find all the faves and those hidden ones you might not have seen on Instagram yet! Murals are broken up into sections by neighborhood and include GPS coordinates, what you're looking for, and a button to submit your pictures. With each mural, make sure to take a picture of you and your girls and send it to us! Visit as many murals as you like, and make sure to check out the great bars along the way. Show them that you're participating in The Crawl of Fame Mural Hunt and get some great drink specials - Gotta have a couple drinks along the way! Challenges and coordinates for over 40 murals! At 10 AM you will meet with the day's other participating mural hunters in Howell's Alley. Howell's Alley is located next to Draper James (2610 12th Ave S Nashville, Tennessee 37204). Sometimes there are many hunters, sometimes there are few. WE WILL SEND YOU A PASSWORD TO ACCESS THE HUNT FROM YOUR SMARTPHONES AT 10 AM ON THE DAY OF YOUR MURAL HUNT. If you stop by the upstairs bar of Headquarters Beercade at 1 o'clock and show them you are playing our scavenger hunt, you will receive a commemorative The Crawl Of Fame™ beer koozie!